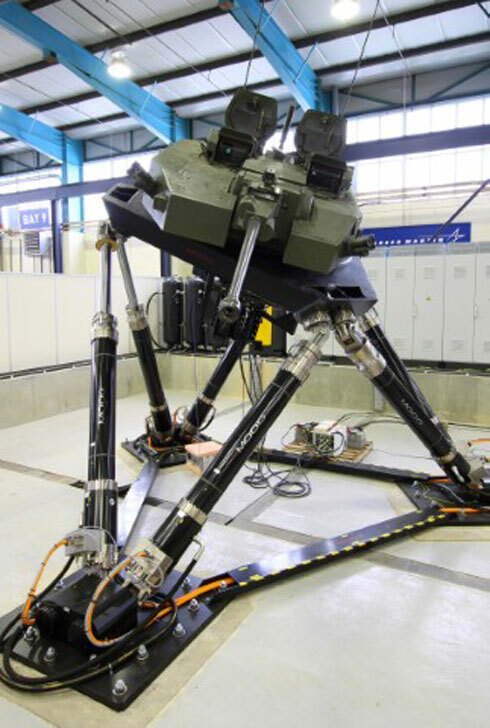 Moog Industrial Group, a leader in providing high-performance test and simulation systems, has delivered a Turret Test System to Lockheed Martin at their facility at Ampthill in the UK. Lockheed Martin plans to test turrets for stabilization and performance on the improved Warrior, as part of the Warrior Capability Sustainment Program and Scout Infantry Fighting Vehicles; General Dynamics UK is the Prime Contractor for the latter. The product developments include fitting and integrating the 40 mm Cased Telescoped Gun in a new modernized turret. This requires optimization of gun aiming and stability performance during maneuvers for representing a typical battlefield mission. In the past this type of testing was undertaken on an external remote test track or proving ground where engineers would adjust the gun aiming and stability settings under less than perfect conditions. Under real test track circumstances, engineers found it difficult to consistently replicate dynamic motion inputs and their work was further limited by weather conditions and the ever-changing terrain. In order to find a solution to improve this way of testing Lockheed Martin turned to Moog, an expert in test, simulation and motion control. The Turret Test System Moog delivered included a 6 Degrees-of-Freedom (DOF) motion base, control cabinet and the Replication Module of the Moog Integrated Test Suites software. The Moog Motion Base System delivers the desired dynamic performance with payloads up to 8,000 kg (17500 lb). On the top platform of the motion base, Lockheed Martin can install an actual turret or a remote weapon station. Moog Turret Test Systems can handle payloads up to 24,000 kg (53,000 lb) and meet specific requirements related to particular excursions, velocities or accelerations. The Moog Replication Software accurately reproduces time history files that were recorded by means of a vehicle with full instrumentation on a traditional test track. This simulation occurs fully in a laboratory, saving time, optimizing the testing process and improving the reliability of test results. The iteration process in the Moog software quickly derives a set of command files that faithfully replicate the desired field responses. The Moog Test System provides 24/7 testing in a controlled in-house environment, enabling the engineers to tweak and perfect the optimum vehicle set-up for combat readiness, saving the costs of putting a real fully operational vehicle on a test track and working in a totally confidential environment. Moog is an industry expert in vehicle platform integration and design. Our expertise in electronics, mechanical design and integration makes us an ideal partner in new vehicle platform design and manufacturing as well as vehicle upgrade and retrofits. Moog Inc. is a worldwide designer, manufacturer and integrator of precision control components and systems. Moog Industrial Group designs and manufactures high performance motion control solutions combining electric, hydraulic, and hybrid technologies with expert consultative support in a range of applications in energy, industrial automation, simulation and test. We help performance-driven companies design and develop their next-generation equipment. Moog’s Industrial Group, with fiscal year 2012 sales of USD 634 million and over 40 locations worldwide, is part of Moog Inc. (NYSE:MOG.A and MOG.B) which has sales of USD 2.47 billion. For more information please visit www.moog.com/industrial. Lockheed Martin UK, part of Lockheed Martin Corporation, is a leader in systems integration, working on major programmes spanning the aerospace, defence and civil sectors. Lockheed Martin UK works with more than 100 business partners and employs some 2,000 people at sites across the UK. Lockheed Martin UK – Ampthill employs around 800 employees and is the largest wholly owned Lockheed Martin site in the UK. The Ampthill facility focuses on a number of programmes including vehicle integration programmes and protection systems. General Dynamics United Kingdom Limited, is a wholly owned subsidiary of General Dynamics (NYSE: GD), and a leading player in the UK’s knowledge economy and industrial base. Established in the United Kingdom 50 years ago, it employs approximately 1,400 people at 11 UK and international facilities. A prime contractor and complex systems integrator, it specialises in the Security and Defence sectors. General Dynamics UK works in partnership with the United Kingdom’s Ministry of Defence (MoD), and is a primary land capability provider. It delivers Bowman, the British Armed Forces tactical communications programme; Specialist Vehicle (SV), the replacement for the British Army’s reconnaissance vehicle fleet; provides surveillance systems to UK forces and is a key partner in the refit and integration of legacy platforms. It also delivers reference programmes to a number of UK allies around the world. General Dynamics, headquartered in Falls Church, Virginia, employs approximately 89,900 people worldwide. The company is a market leader in business aviation; land and expeditionary combat systems, armaments and munitions; shipbuilding and marine systems; and information systems and technologies. More information about the company is available on the Internet atwww.generaldynamics.com.